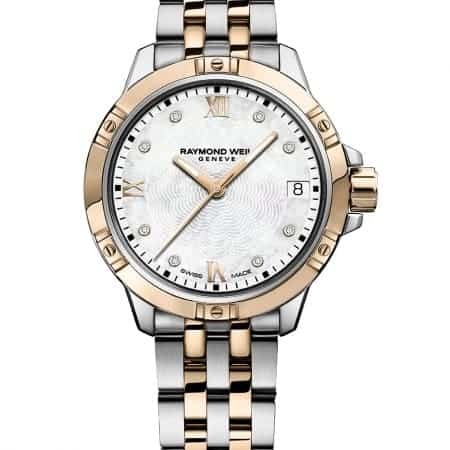 Built with precision, finished in gold, and internationally famous… the Raymond Weil Tango is a contemporary watch for all time. Find yours on these pages. Watchmaking has a prestigious history in Switzerland. Built up during the last 40 years, the Raymond Weil watch company is still in family ownership – today, it’s one of few remaining independent watchmakers. Raymond Weil watches are beautifully and carefully made – with each one undergoing 350 checks before being packaged for despatch. Precision, quality, and reliability take precedence over speed or savings. But the company has one eye on the future, and has introduced some pioneering technologies during the past couple of decades. In their watchmaking workshop, you’re just as likely to see a watchmaker using computer-aided design as picking up an old-fashioned tool to finish their work. In 1999 the company set up a Research and Development department. They invented the Dual Timezone system and a patented interchangeable bracelet. In 2006 new innovations included a split-second chronograph with power-reserve indicator, the visible balance wheel, and the introduction of carbon fibre. The Maestro watch was launched with a phase de lune (moon phase system). It’s these innovations that have ensured the company’s future. 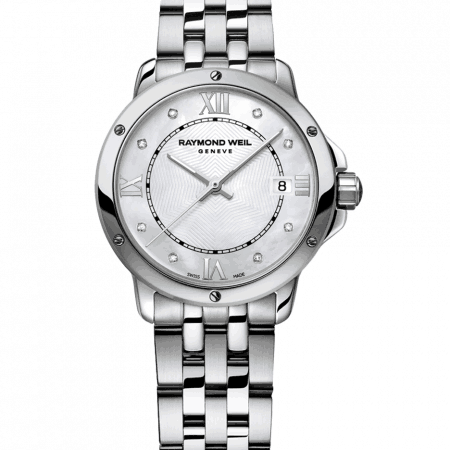 Designed and launched in the 1990s, the Raymond Weil Tango now features a wide range of models. This early design proved to be a big hit and has remained well-loved ever since. Raymond Weil Tango is an industrial, beautifully engineered watch for the active, stylish woman. It’s been designed with thoughtful touches like an anti-glare crystal screen and a double-push bracelet fastening for security. It features accents of rose or yellow gold, and is inlaid with up to 50 diamonds (depending on model). 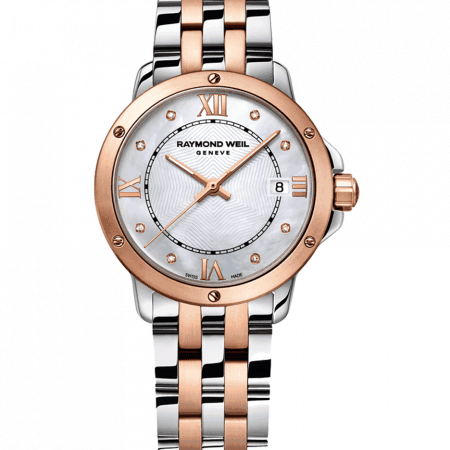 The Raymond Weil Tango men’s watch is an engineering masterpiece, raring to go. Four decades of watchmaking experience go into its design and manufacture. As you’d expect, it’s water-resistant, scratch-resistant, and secured with a double-push system. 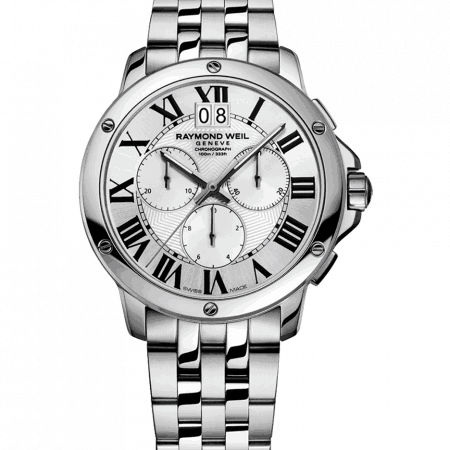 The look is smart and athletic: inspired by the sports watch, with a sophisticated modern edge. You can use it to measure the time it takes you to sprint the last 1k of your run – or the precise time taken up by your daily commute. The Tango is a neat, practical, everyday watch from one of the world’s greatest watchmakers. 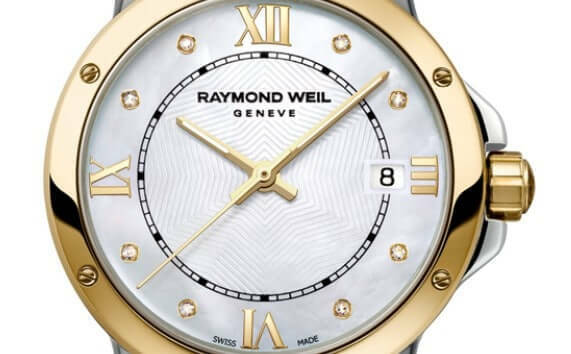 Use the website to get a close-up look of the Raymond Weil Tango watch, and explore features and options. But for the best buying experience, we recommend viewing in-person. Our London store has a relaxing and unpressured atmosphere in which to try on and admire the Raymond Weil watch collection. We won’t sell you anything that you don’t unconditionally love. Use LIVE CHAT to find out what’s in stock, or book an appointment.